This is the best Christmas pud recipe ever, from Eliza Acton’s classic book “Modern Cookery” of 1845: “a remarkably light small rich pudding”. You will need a 1.2litre ceramic pudding bowl, or two x 600ml – or individual bowls, if you prefer, as in the picture. You’ll also need some greaseproof paper, foil and kitchen string. (You can use plastic bowls with lids, but the old-fashioned way with greaseproof paper and foil produces a darker and more attractive pud.) 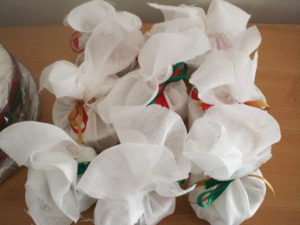 For presents, wrap in fresh muslin and decorate with ribbons, as shown. Use a large mixing bowl. Simply mix everything together in the order given, adding each ingredient in turn. Stir very thoroughly – and don’t forget to make a wish! If you like, you can add a 5p coin, wrapped tightly in greaseproof paper. Pack the mixture firmly into the pudding bowl or bowls, but don’t fill right to the top – leave about 5mm space, then cover the pudding layer with greaseproof paper. If using plastic bowls, clip on the lid/s now. If using ceramic bowls, put on a lid of foil and tie a string handle around the top of the bowl so that you can lift it in and out of the pan. Put the pudding/s in a saucepan of boiling water, to come 2/3 of the way up the sides of the bowl. Turn down the heat, put a lid on the saucepan and simmer for about 3 hours for big puds; 1 ! hours for mini-puds. Check that the water levels stay just right – not too low (won’t cook properly) and not too high (the fat from the pudding will escape). They’re cooked when nicely dark. Store in a cool dark cupboard till Christmas, then replace the foil and reboil for about an hour for large puds, ! hour for mini-puds. Traditionally you should make this on Stir-Up Sunday, the last Sunday in November, to give your puds time to mature, and bake your Christmas cake on the same day. But a week or two later is fine.